Dalit-Brahmin `bhaichara’ delivers Uttar Pradesh to Mayawati, who is looking to replicate the experiment in other northern States. THE celebratory crowds that streamed into Lucknow on May 13, the day Bahujan Samaj Party (BSP) chief Mayawati took over as Chief Minister of Uttar Pradesh, heading the first single-party government in the State since 1991, were not only massive but also presented a unique study in sociological terms. This flow of humanity into the capital from all over the State was indeed a reflection of the social combination that has taken the BSP to unprecedented electoral success. The vast majority were Dalits, the BSP’s core support base. The new followers of Mayawati’s leadership, Brahmins, also formed a significant segment. Members of both communities were united in celebration and yet there were conspicuous contrasts between them. Most Dalits were dressed in old and frayed clothes, whereas the Brahmins, on the whole, were in newer and better attire. 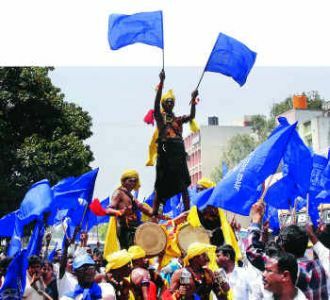 Most of the Dalit groups were perceptibly from a rural background, while the Brahmins displayed the trappings of urban exposure. Representatives of the BSP’s traditional vote base looked robust and rugged, whereas the neo-converts had a softer appearance. In short, they presented a combination of the highest and the lowest in the socio-economic hierarchy of Uttar Pradesh. A group of Dalits had come from Karchana in Allahabad district "to take part in Behenji’s swearing-in ceremony" and "celebrate their own victory against the Thakur-dominated Samajwadi Party [S.P.] in their area". They were indeed aware of the dissimilarity between them and the rising Brahmin support base of the party. But their perception of the differences and their interpretation of the new socio-political collaboration had dimensions beyond the conventional. The leader of the group, a sexagenarian activist who has been with the BSP right from the mid-1980s when Kanshi Ram started the party, told Frontline that for members like him the day, literally, had epic proportions. "It is not merely because the party has won a majority on its own but because the elections and the swearing-in ceremony overturned a rigid Brahminical socio-cultural custom that persisted for centuries, right from the period of mythical history," he said. He went on to say that Brahmins as the priestly community had consistently refused to anoint any of the lower castes into dignified positions of power or spiritual supremacy. "Mythology says sage Vasistha was opposed to according Brahmarishi status to Vishwamitra and history has recorded how Brahmin priests across the length and breadth of the country refused to perform Raj Tilak [accession of power] ceremonies for Shivaji just because he was a Maratha. Shivaji was ultimately compelled to kidnap a group of priests from Varanasi, hold them at knifepoint and get his Raj Tilak done." "Today we are witnessing the Raj Tilak of a Dalit, and that too of a woman, virtually conducted by hundreds of thousands of Brahmins," he said. The group refused to say whether this line of thought was consciously being propagated within the BSP following the election victory. Whatever the fact, their interpretation, rating the 2007 results as epoch-making deliverance of lower castes from historical subjugation, points to the hopes and expectations of the BSP’s core supporters from the "party’s own government". Talking to Frontline, senior BSP leader Sukhdev Singh Rajbhar, who has been part of the party organisation from the early stages, admitted that hopes and expectations were high because the party now had a majority on its own. But he added that the core Dalit base realised that this victory was only one big step in the struggle of the marginalised sections to assert their rights and empower themselves. He said: "They have grown up with the BSP from the state of being nobodies, who could not even exercise their franchise, to the point of getting a Chief Minister on the strength of their own party. Clearly, their social, political and cultural standing has improved and they know this will improve further in due course." The point the veteran leader apparently made was that the new hopes and aspirations would not manifest themselves as demands immediately. Hence, the leadership may not have to address the issue in haste. Mayawati’s first actions after assuming office, including the constitution of the Ministry, indicate that the BSP leadership is moving forward in the manner that Rajbhar suggested. Almost all her actions have been characterised by a need to retain the party’s Dalit base and reassure its new support base of Brahmins and other higher castes such as Banias, so as to consolidate their support. Mayawati has made it clear that the principal focus of the government would be the welfare of sarva samaj (entire society) and not particularly Dalit samaj or bahujan samaj. This balancing act is reflected in the caste composition of the Ministry too. The list of Cabinet Ministers includes eight Dalits, four Brahmins, four members of the Other Backward Classes (OBCs) and one each from the Muslim, Baniya, Thakur and Bhumihar communities. The Ministers of State with independent charge include 11 Dalits, seven OBC members and four each of the Brahmin, Thakur and Muslim communities. Some of the Brahmin legislators of the BSP said the Ministry formation exercise came as a great relief. "Though all of us joined the BSP to win the elections and become MLAs [Members of the Legislative Assembly], there was no certainty on the level of accommodation we would get in the government. Apprehensions on this count increased when the party got a majority on its own. But Behenji has removed all the tension by the even-handed exercise," one of them said. Clearly, Brahmins are second only to Dalits in the Ministry in number as well as importance. The OBC members, though numerically stronger as a group, belong to different castes, many of which compete with one another for social, economic and political supremacy. According to veteran political analyst Hariraj Singh Tyagi, a long-time associate of the legendary Socialist leader Ram Manohar Lohia, who asserted the importance of caste as a factor in Indian politics, the composition of the Ministry and the projection of sarva samaj make it clear that Mayawati’s short- and medium-term aim is to enhance her appeal among Brahmins. "The Chief Minister," Tyagi said, "is making a blatant appeal to the community through these steps." He felt that this was in keeping with the tactics traditionally followed by the BSP and the S.P. He said: "This tactic of openly addressing caste identities and their interests is the fundamental difference between the political practice of parties such as the BSP and the S.P. and the Congress-type of caste politics, which seeks to address caste identities in a camouflaged manner." Tyagi added that many academic studies, including those by scholars Paul Brass and Kanchan Chandra, had pointed to this phenomenon. A number of senior BSP leaders told Frontline that the importance being given to Brahmins in the government is not only a form of thanksgiving but also a prospective initiative for replicating the social combination in other northern States. A Cabinet Minister said: "Both Behenji and Satish Chandra Mishra, the virtual number two in the party, believe that the Dalit-Brahmin bhaichara experiment can be replicated at least in Madhya Pradesh, Rajasthan and parts of Punjab with minor variations." The leadership, the Minister pointed out, need not be with Dalits in each State. The aim is to advance the central idea of a Dalit-Brahmin-Muslim combination. He added that the top leaders felt that Dalits were, as a community, moving away from the mainstream parties and the BSP had the potential to intervene and take up a leadership role. Political analysts like Tyagi say that while the projection appears good on paper, Mayawati and her associates have a long way to go before getting anywhere close to realising the objective. To start with, Tyagi pointed out, neither the Congress nor the BJP in all the three targeted States (Madhya Pradesh, Rajasthan and Punjab) suffered from a dearth of political leadership. "In Uttar Pradesh, the leadership of both parties had created a vacuum, especially among Brahmins, and the BSP could fill it. The other States, as things stand now, do not offer a similar opportunity." According to an upper caste BSP MLA who had switched from the BJP, Brahmins in Madhya Pradesh and Rajasthan were not yet ready to accept Dalit leadership, both socially and politically. He said: "Brahmins of Uttar Pradesh were compelled to [accept Dalit leadership] by the persistent rise of OBC and Dalit assertion, but Rajasthan and Madhya Pradesh have not reached that stage." Former Maharashtra Governor P.C. Alexander is a close observer of north Indian politics. In his view, the BSP can hope to make a larger impact at the national level, or at least in north India, only by providing good governance in Uttar Pradesh. Some of the early actions of Mayawati, such as the induction of 10 members with criminal antecedents into the Ministry and the mass transfer of over 250 bureaucrats, do not fit the standard mentioned by the former bureaucrat and Governor. Large sections of the BJP and the Congress, especially in Uttar Pradesh, are wary of the organisational tenacity of the BSP. These sections, which have been at the receiving end of the BSP’s organisational piercing, fear that the Dalit party may well repeat Uttar Pradesh in the targeted States. The perspectives on the BSP’s prospective initiatives in other States may differ, but there is general agreement in the political class and the bureaucracy that the government will face a tough predicament when the socio-economic agendas of Dalits clash with those of the new upper caste support base. There are stark differences in the socio-economic situation of these communities and these could well trigger fierce differences in terms of priorities. The BSP has 44 crorepati MLAs, and it is anybody’s guess whether their socio-economic priorities would fit in with the politics of empowering the weaker sections. According to the estimation of a number of non-government agencies involved in social development work, the land-holding population among Dalits is less than 8 per cent, while among the upper castes it is close to 65 per cent. These estimates also have it that 55 per cent of the Dalit population is employed in the unorganised sector and 32 per cent is composed of agricultural labourers. 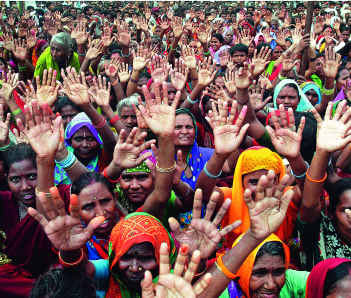 Nearly 33 per cent of the Dalit population is illiterate and only 12 per cent has education above the secondary level. Less than 10 per cent of the upper caste population is illiterate and more than 50 per cent has education above the secondary level. Clearly, the imposing political and social voice that Dalit communities have acquired in the past two decades under the BSP’s leadership is yet to translate into concrete socio-economic development. The new expectations and aspirations of Dalits about their own government could well be in bridging this gap. The biggest question in this context is whether the BSP’s political leadership, especially Mayawati, has the skills to live up to these hopes and to manage the contradictions that the conflicting priorities are bound to throw up. Mayawati has expressed the confidence that she will be able to take sarva samaj together. "If I can get them to vote together, I can also advance their interests together," she says. But, as many a politician would vouchsafe, living up to the expectations of the electorate and providing good governance is much more difficult than raising the hopes of people and winning elections.